Farm to Cafeteria Canada is a new national network that is working to get more local food activities happening in hospitals, schools, and universities. It is an ongoing, 15-month project that works to develop a network of rural producers, potential new farmers, food processors and food distributors to help institutions across Canada access local food. Participate in the first national Farm to Cafeteria Canada Survey! Farm to Cafeteria Canada is conducting the first ever nationwide online survey of activities to bring local, nutritious and sustainably produced foods into schools, health care facilities, and universities/colleges. Activities may include: sourcing and purchasing local foods; growing, processing, preserving, and serving local foods; composting food wastes; promoting and/or teaching about local foods; and developing local food policies. The survey will help describe the Farm to Cafeteria landscape across Canada and help inform strategic planning to better support these activities nationwide. There will be three surveys throughout the month of June 2012: a school survey, a healthcare survey and a campus survey. Save the dates! “Dig In” webinars will be offered on the 3rd Tuesday of each month at 3 pm EST. Check out CBCs coverage of hospital food. View the full article “Hospital Food Revolution Takes Root” for more details. 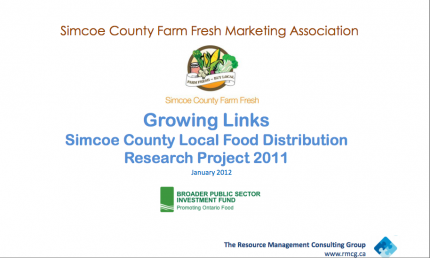 Simcoe County Farm Fresh conducted a report in response to the recognition that gaps in local food distribution is a common barrier to get the food grown and produced in Simcoe County out to those how want to buy it. The research was funded by the Broader Public Sector fund but the outcomes are applicable to both the private and public sectors.